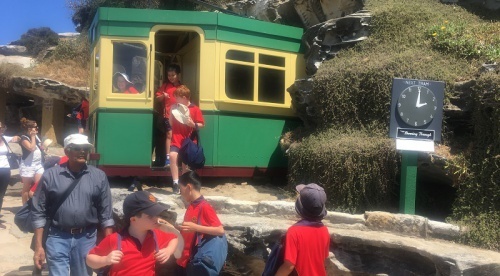 Children enjoy Simon Rathlou’s Bondi tram, “Shooting Through”. 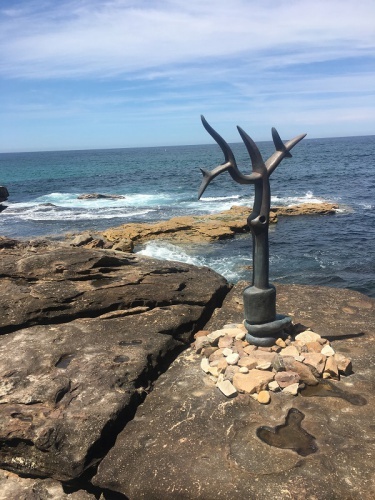 OUTDOOR sculpture events abound in Australia and in Canberra’s immediate region such as Sculpture in the Paddock and Queanbeyan’s Clearwater Sculpture Prize, but without doubt the parent of them all is Sculpture by the Sea. 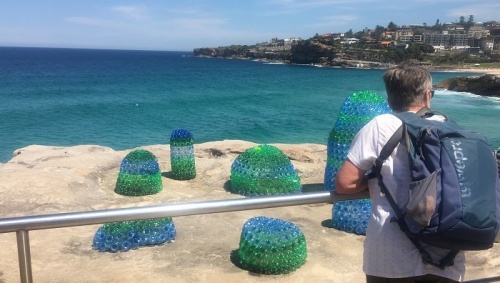 Sculpture by the Sea is the extraordinary 2km long Bondi Beach to Tamarama Beach coastal walk, this year celebrating its 21st anniversary, that proudly proclaims itself the world’s largest “free to the public” sculpture exhibition. 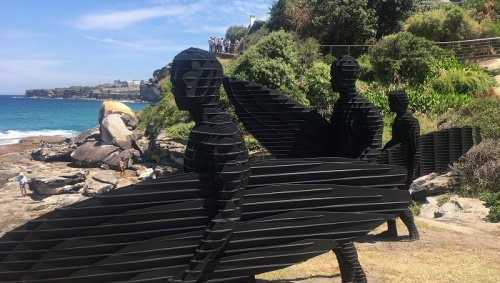 “CityNews” walked the walk and talked the talk earlier this week, enjoying the spectacular coastal views and over 100 sculptures by artists from Australia and across the world. 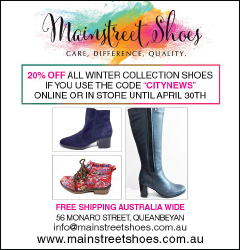 In the process, “CityNews” spotted at least five Canberra region artists with work on show – S.A. Adair, Stephen Harrison, Hanna Hoyne, GW Bot and Michael Le Grand. Apart from questions of intrinsic sculptural value, these are first and foremost site-specific exhibitions, so visitors will have to feel a bit sorry for those artists whose work was displayed in the crowded “sculpture park” at the top of the hill between Bondi and Tamarama, some of which seemed lost. Many sculptures in the exhibition this year came from Japanese artists, some creating huge glass installations that caught the light and the waves. Stephen Harrison’s “Molly and Charles”. 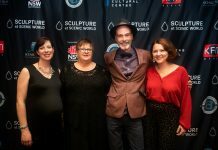 Two of the Canberra region sculptors have scored well in location. 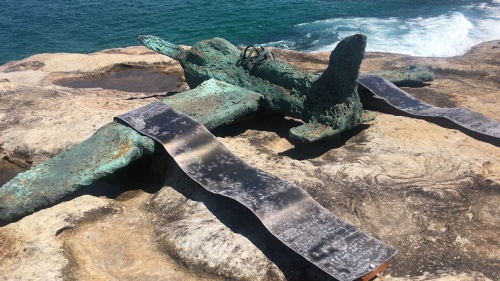 Stephen Harrison’s quirky aeroplane-like sculpture “Molly and Charles” sits on the edge of a rock looking as if it’s just landed – the work attracted many photographers and onlookers. GW Bot’s “Sea Eagle Glyph” also has a spectacular setting, suggesting that the Sea Eagle too has just landed. While Sculpture by the Sea’s stated aim is “to foster the appreciation of sculpture as an art form and the careers of artists, and to provide significant educational and cultural benefits for Sydney”, much of it is sheer fun, like Simon Rathlou’s “Shooting through”, a partial Bondi tram emerging from the cliff face, representing Bondi’s past and maybe its future – that one had the kids clambering all over it. On a similar line and consistent with the surfing culture of the area are April Pine’s “Trip I”, “Trip II”, and “Trip III”, which are joyous representations of surfers carrying their boards. Installations such as these had both the kids and the adults talking with considerable animation about the sculptures they saw. 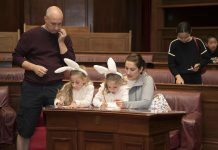 The conversation created around the art works was matched with sculpture workshops and talks. Most talked-about were the sculptures, and there were many of them, representing new forms of marine life, perhaps jellyfish, seaweeds, or sea-slugs. Works by Kelly Allam and Tata Ota fell into this category, inviting comment and interaction. Sculpture by the Sea is the prototype of this burgeoning form of exhibition, although its sister exhibition at Cottesloe Beach in W.A. comes a close second. 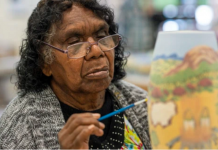 But whether it’s sculpture by the sea, the lake or the river, there are common elements to all of these exhibitions, which have boosted the careers of many artists over the years.